Your privacy is paramount at The Abbey at Stone Oak, where you will find private entrances, attached garages, and a private balcony in each of the one, two, and three bedroom floor plans. 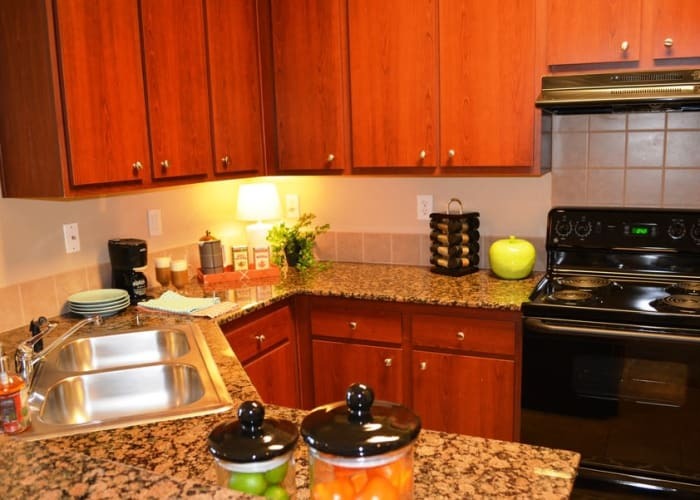 Our townhome-style apartments feature a split-level floor plan, a fully equipped gourmet kitchen, and spacious walk-in closets, so you never have to worry about finding room for new clothes. Enjoy luxurious details such as granite countertops, designer lighting, and custom cherry cabinetry. A serene suburban lifestyle awaits you at The Abbey at Stone Oak. Our sparkling swimming pool features a relaxing sundeck with grilling stations and lounge seating. Work out in the onsite fitness center or spend some time enjoying the outdoors in our landscaped grounds, complete with a picnic area and playground. You can also take advantage of our onsite clubhouse and business center. We are thrilled to extend a welcome to up to two pets per apartment at The Abbey at Stone Oak. Some qualifications and manager approval do apply. Contact our leasing office for more information about our pet policy. Discover an elevated way of living at The Abbey at Stone Oak. Schedule a personalized tour today.